Today, three-dimensional imaging is offering the field of dentistry previously undreamed-of diagnostic and therapeutic options in the fields of surgery, prosthetics, orthodontics, and restorative dentistry. Your safety is our greatest concern. With this in mind, we utilize the Sirona Galileos CBCT Scanner. This scanner produces the least amount of radiation of any commercially available CBCT scanner. 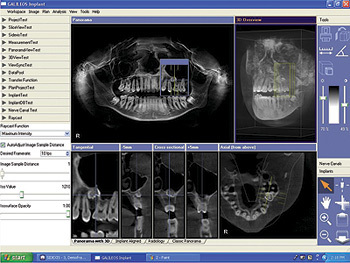 GALILEOS CBCT (Cone Beam Computed Tomography) was developed for the dental practice – the tailor-made answer to your dental issues. 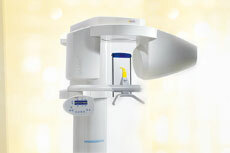 Most of the CBCT scanners are square-like machines. You will sit or stand upright while a C-arm rotates around your head. Within the arm there is an X-ray source and detector (X-ray receiver), which will make one complete 360° rotation for each scan. While the arm is rotating, it is capturing multiple images of your head from different angles. These images are then reconstructed to create a 3D image of your internal anatomy. Some of the CBCT scanners have you lay down on a table that can move up or down, and slide into and out of the center of a hole, while a gantry makes the 360° rotation. • X-Ray Radiation exposure to the patient is up 100 times less than a regular CT scanner. As with all imaging modalities that use ionizing radiation, the use of CBCT does involve a consideration of risk to the patient. However, it has the benefit of providing useful information needed to assist in making a diagnosis and/or in facilitating treatment. When your doctor refers you for an x-ray examination, he has made the determination that the benefit outweighs the risk. Of course, it is ultimately up to you to decide whether to undergo the examination. Bear in mind that the risk of most x-ray examinations are much less than other risks we commonly accept in daily life. Will my dental insurance cover this? That depends on your dental insurance but this procedure can also be billed to your medical insurance and if it is covered it will save your limited dental benefits for needed dental treatment.